In the past, the hearth or fireplace was an essential part of country living. Most people cooked in their fireplaces and used them as an essential source of heat. Even though fireplaces are common features in many modern homes, they aren’t essential to our everyday lives. Consequently, they are often neglected. If you have a home with a fireplace and you only decorate it around Christmastime, you are missing out on a great opportunity, especially if the rest of your home is decorated in a farmhouse style. 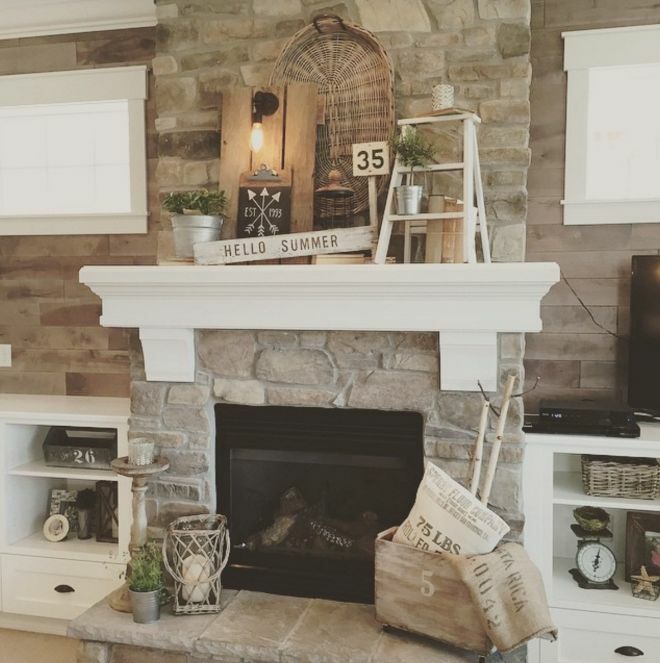 If your home is already decorated in a farmhouse style and you don’t have a well-styled mantel or you are thinking about decorating your home in farmhouse style and need a few ideas for your mantel, Meadow Lake Road has some great tips for designing yours. And for more ideas, gere are 14 stunning ones that are sure to get your creative juices flowing. 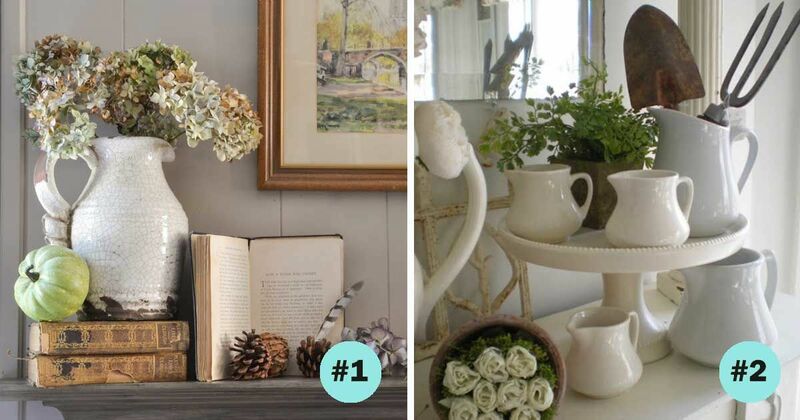 White containers and greenery add to a farmhouse mantel by creating a sense of calm. Pots. Watering cans. Flowers. All of these things are associated with country living and make a farmhouse-style home feel even more cozy. 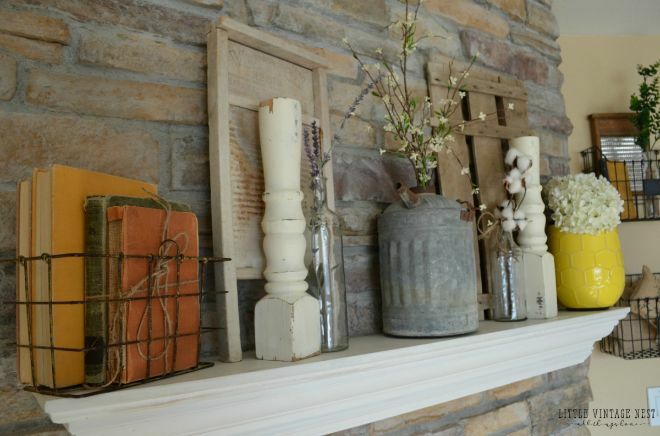 Any vintage items, even things you wouldn't necessarily associate with a mantel, such as old washboards can help a fireplace mantel look great. 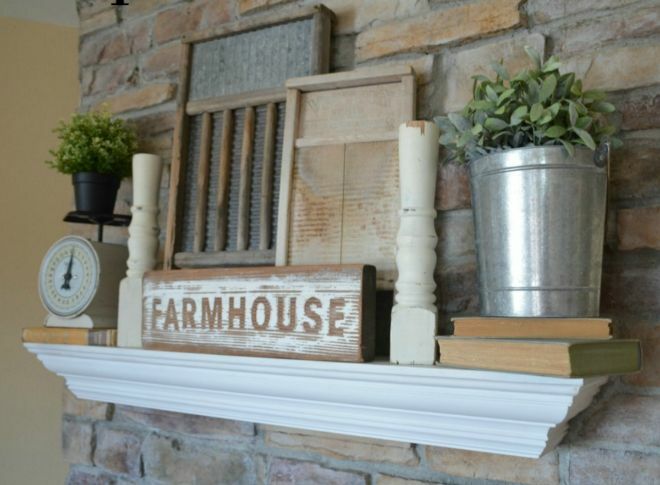 A sign that says "farmhouse" makes it absolutely obvious to onlookers that you are going with farmhouse-style for your mantel. Old books with bright colors and a bouquet of flowers in a brightly colored vase add splashes of color to an otherwise simple mantel. Repurposing is the name of the game when it comes to farmhouse style. 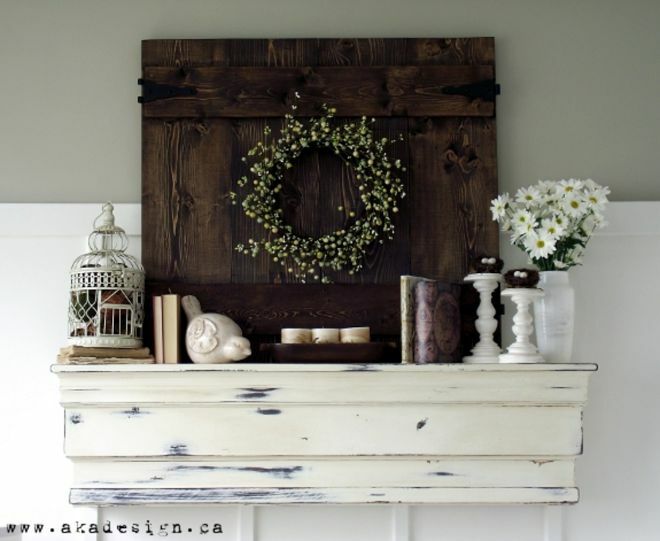 Even an old cabinet door can make an exciting mantel-place conversation piece. 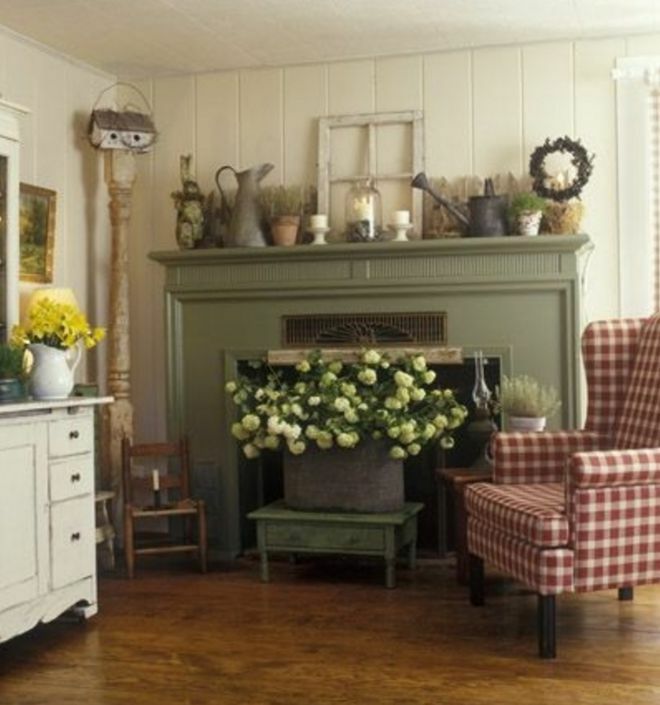 If you are worrying that you'll have to change the look of your your farmhouse-style mantel often, don't. 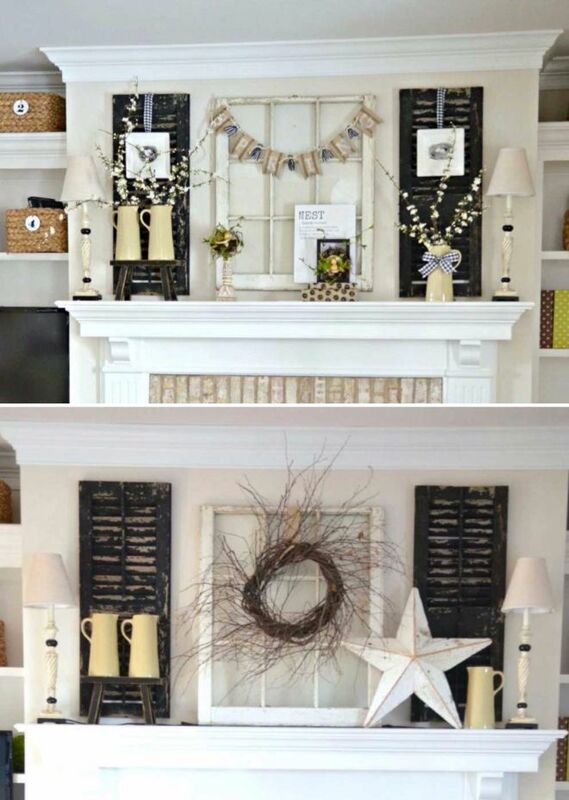 Core farmhouse style mantel place designs, even though they incorporate a lot of disparate elements, play nice with additional, seasonal decorations. 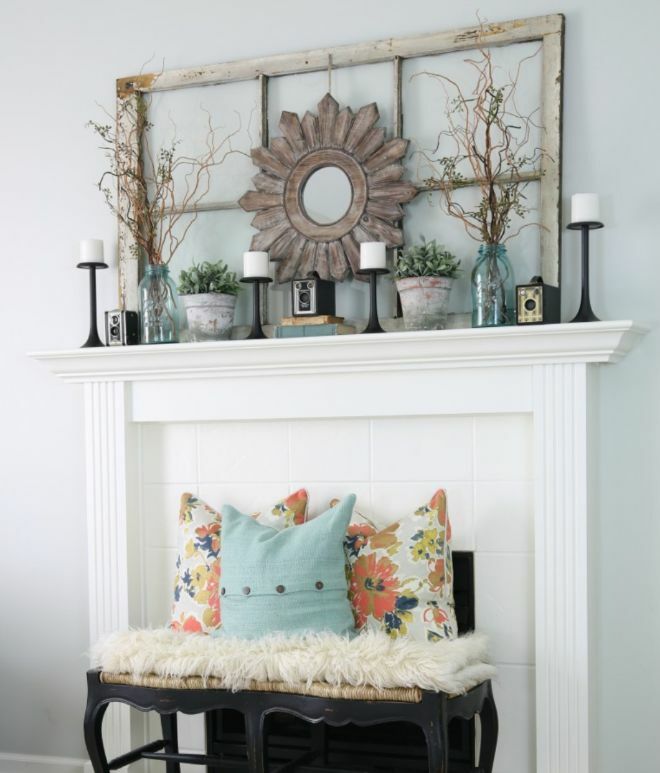 An old window makes a nice frame for a fireplace mantel. A mirror that is shaped like a sun, placed in the center of the window adds a nice focal point for the mantel. 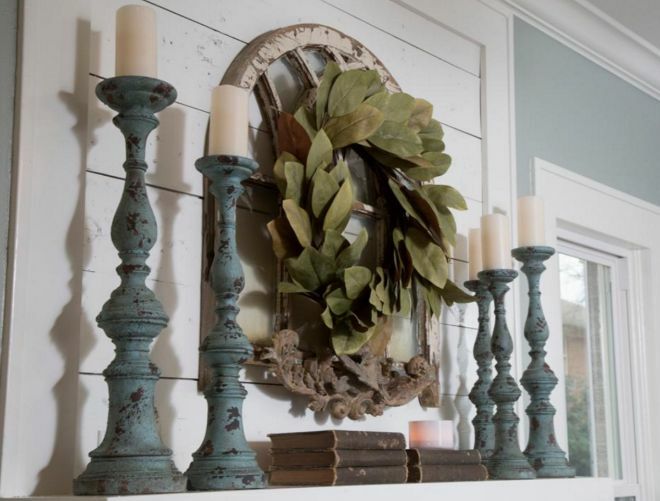 A natural wreath made of leaves hanging on an antique mirror and distressed books and candlesticks make for a noteworthy farmhouse-style mantel. 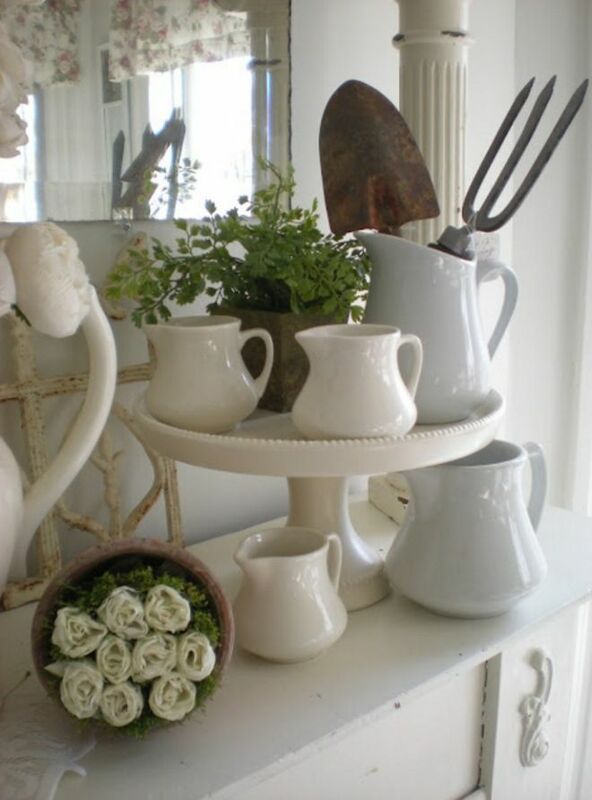 Wood and wooden objects are essential farmhouse styling elements. A mantel decorated generously with wooden knickknacks and a few splashes of green exemplifies farmhouse style. 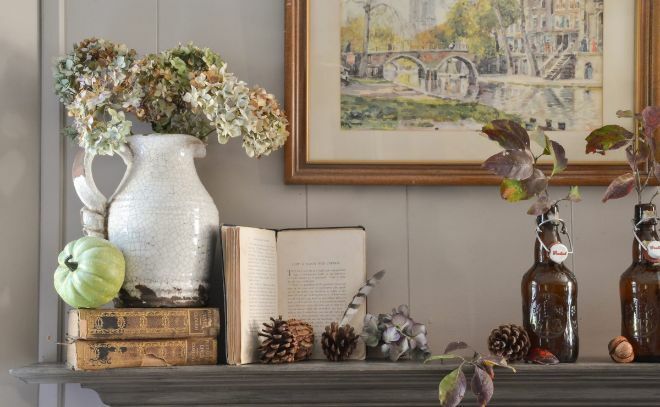 Seasonal produce and fresh flowers and plantlife add a charming touch to a farmhouse-style mantel. No fireplace in your home? Don't worry. 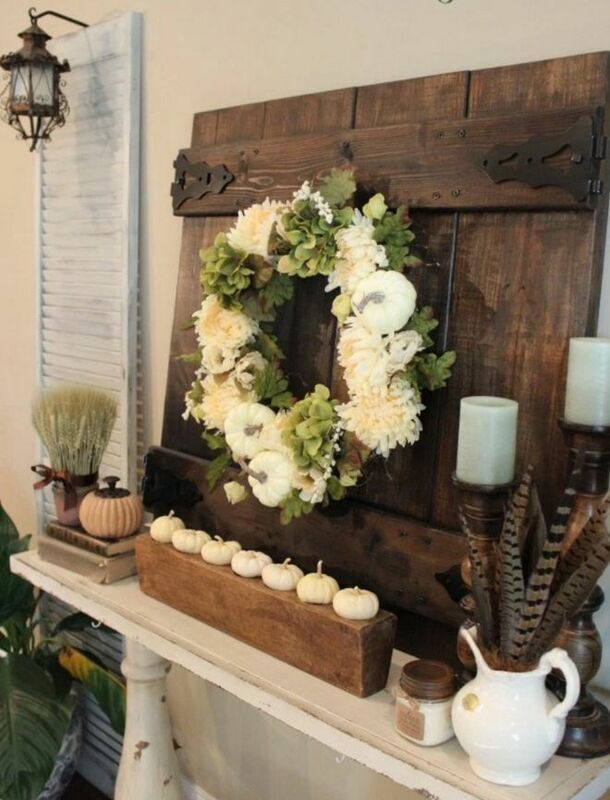 You can still have a farmhouse-style mantel. 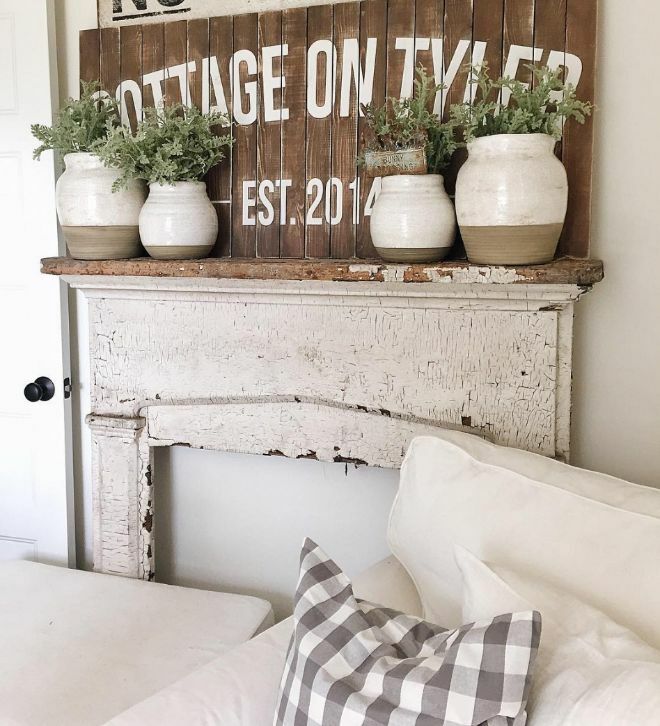 An old, wooden sign on a faux mantel and potted plants in white, earthenware pots are remarkable reminders of how easy farmhouse style can be. 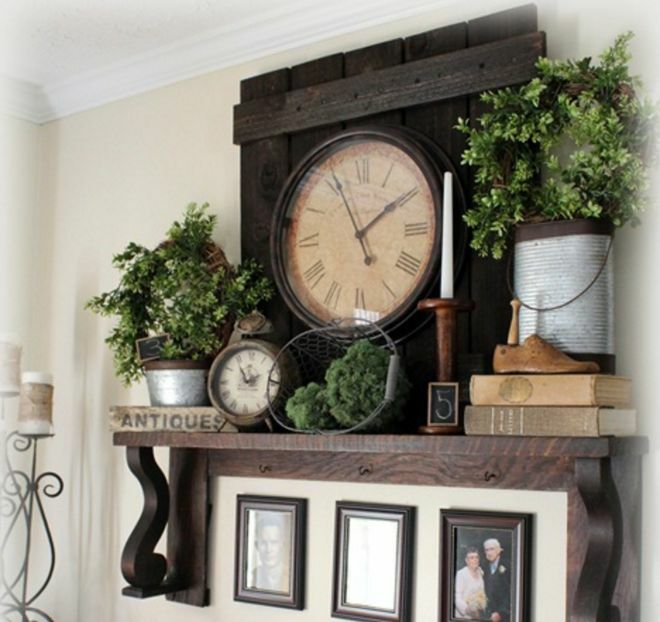 An old clock, antique touches and a dark wooden shelf add a natural frame for important photos and make for a impressive faux farmhouse mantel. A distressed shelf topped with candlesticks, candles and other bric-a-brac, when teamed up with an old cabinet door, make for a dazzling faux mantel. If you liked these ideas, don't forget to SHARE them with your friends! These floor plans have all the main living amenities on the first floor. Hidden within the polished but nondescript exterior is a stunningly designed home full of built-in features and amenities sure to make anyone envious.